Dem Rory Gallagher Tribute Modell liegt der Hornby-Skewes Treble Booster mit Volume-Regler, so wie auch Ritchie Blackmore ihn spielte, zugrunde. Verglichen mit diesem liefert er aber mehr Gain und Punch. Um Rory's unvergleichlich körnig-saftigen Tone zu bekommen, reicht ein halb aufgedrehter Volume Regler. Dreht man ihn ganz auf, kommt man zu einem fetteren Lead Sound, der dynamisch und offen bleibt und durchsetzungsfähig ist. Nimmt man eine Les Paul mit PAFs und dreht das Volume des Boosters halb auf mit dem Volume Poti der Gitarre auf 7, erscheinen wunderbar druckvolle, braune Vintage Rock Sounds, die nach sehr großer Lautstärke klingen! Bekannt war Rory zunächst für seine Verwendung eines Range Masters, er wechselte später aber auf den relativ unbekannten Hawk Booster, der dem Hornby-Skewes sehr glich. The BSM RG Rory Gallagher tribute model is based on the British HORNBY-SKEWES unit first issue produced early 1967, used by Ritchie Blackmore, the brilliant and impulsive guitarist of Deep Purple. The unit produces a powerful and biting sound that was used to help create the epochal masterpieces e.g. "Deep Purple In Rock" and "Fireball". The long yearned new edition was issued under the name HS from BSM, including the same germanium transistors as the original 1967 version. The RG Rory Gallagher tribute model is basically a HS-C Custom, modified to nail Rory Gallaghers signature tone known from his famous recordings. Compared to the HS-C Custom, it offers more gain for a more punchy sound with a good crunch. 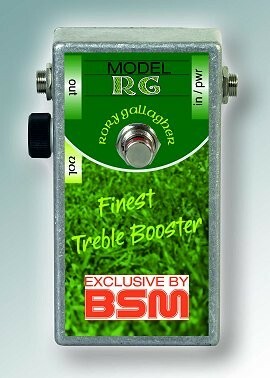 The RG Rory Gallagher tribute model, includes the same volume control, like Blackmore's modification on his treble booster. When dialed about halfway, you will achieve Gallaghers sound from his early records like "Deuce", "Live in Europe" and "Against The Grain". 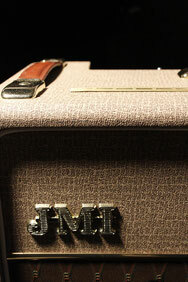 It is also of interest to note, that Rory Gallagher played a standard Fender Strat into a VOX AC30 "top-boost" amp. The only stompbox he used, was his treble booster. After he used a Rangemaster for some time, he switched to the rare Hawk booster, which was very similar compared to the much more common Hornby-Skewes.